United States rider Ben Spies has signed a one-year contract extension to stay with Yamaha until the end of 2012. The 26-year-old won the World Superbike crown on a Yamaha in 2009 before making the step up to MotoGP with the satellite Tech 3 Yamaha team last year. A successful debut season earned him a ride alongside reigning world champion Jorge Lorenzo in 2011. "I am very happy to say that I will remain a part of the Yamaha family," said the Tennessee-born rider. "This is a privileged time of my career riding for the most successful team in recent years at the very highest racing level. "Yamaha has been great in supporting me through World Superbikes and on to MotoGP and I want to thank them for all they have done, and for giving me their trust to continue in MotoGP in 2012." Spies, who replaced Valentino Rossi at Yamaha when the seven-time MotoGP champion moved to Italian squad Ducati, endured a tough start to the season, failing to finish twice in the first four races. However, the 26-year-old took his first podium of the season at the last round in Catalunya and is now up to seventh in the 18-rider standings. Yamaha Motor Racing managing director Lin Jarvis expressed his delight at extending Spies' deal. 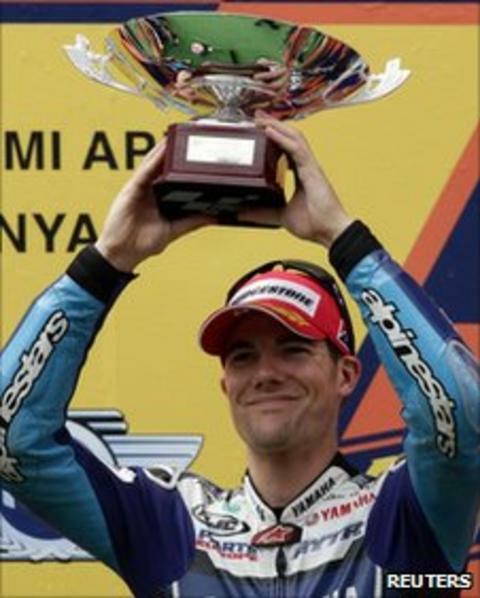 "We are obviously delighted to announce the continuation of our partnership with Ben for the 2012 season and we hope that he will remain at Yamaha for many years to come," said Jarvis. "Ben has shown his ability to successfully compete at the highest level. "His transition to the Yamaha Factory Racing team in 2011 has just begun and we have every confidence in Ben's abilities and high potential for the future."